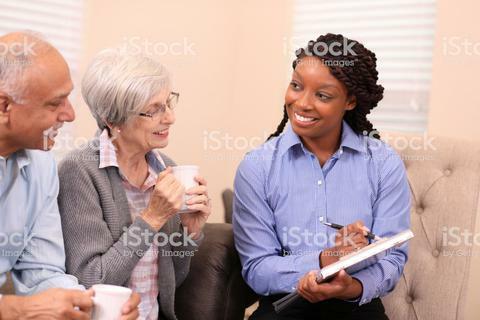 The finance-savy couple met with their financial planner to discuss their latest retirement options and strategies. This home setting captures the advisor meeting with the couple over a cup of coffee. The generically-styled consultant could also be a final expense advisor, insurance agent, designer, or realtor. Designed to meet any of your "home consultation" marketing needs, be sure and click the link below to view all the images from this shoot!